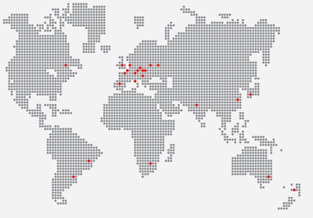 Thermit Ltd was first established in London in 1904 by the Goldschmidt Company. In 1919, Goldschmidt formed Elektro-Thermit GmbH in Essen to develop and market the Aluminothermic business and in 1958 Thermit Welding (GB) ltd was formed by Murex Ltd and Elektro-Thermit GmbH, based at its present location in Rainham, Essex. Murex ltd was subsequently taken over by BOC who later sold its holding in the company to the TH Goldschmidt AG. In 2000, the company reverted to full ownership by the Goldschmidt Thermit Group which comprises of over 20 companies associated with the development, manufacture, distribution and technical support for the Thermit Welding processes. Today, the company remains a strategic supplier to the Railways, and continues to develop products and welding methods to meet the demands for continual improvement, with investment in new production methods, Research and Development, on-site training, technical support and specialised contract services. Thermit process production, stocking and distribution, quality control, engineering, equipment development and assembly, and sales administration, are all based at our main premises at Rainham, where there are also our analytical laboratories and facilities for welder training. Thermit Welding (GB) and the whole Goldschmidt Thermit Group, remains committed to a strategy of expanding its scope of services to the rail industry.